This items comes with Coin Embossed edge that gives it a great look. Our go to napkins and our most popular great quality 3 ply napkin at a great price. Customized with a high quality imprint. Our go to napkins and our most popular item. 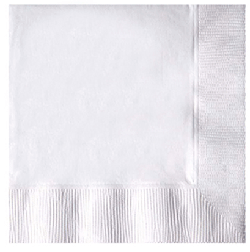 Great quality 3 ply napkin at a great price and customized with a high quality imprint. Coin embossed edge for a classy look of the napkin that stands out. Choose from a large variety of imprint colors that match your event on these great napkins.